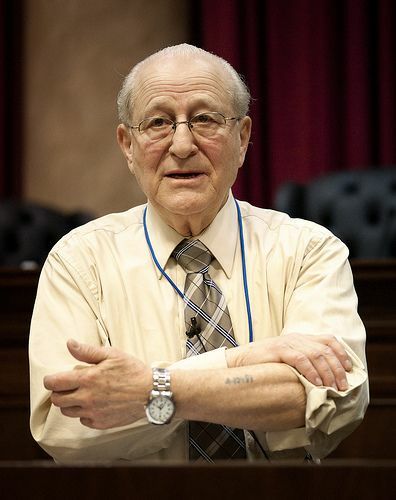 GARDEN CITY, N.Y. - April 17, 2018 - PRLog -- Irving Roth, director of the Holocaust Resource Center (https://www.temple-judea.com/holocaust-center/) at the Temple Judea in Manhasset and survivor of Auschwitz, will speak at Adelphi University on Monday, April 23. The event will take place 3:30 to 5 p.m. in the University Center Rooms 215 and 216, with Roth discussing the importance of Holocaust remembrance, as well as his own experiences. Roth was born in 1929 in Kosice, Czechoslovakia, and grew up in Humenne, where his father owned a lucrative lumber business. The family was forced to flee to Hungary during the war and, in 1944, they were transported to the Auschwitz death camp along with millions of other Jews. Out of the 4,000 people on the train, only 300 would survive, with Roth being one of them. After enduring the infamous "death march" of the remaining Auschwitz prisoners in January 1945, he was liberated from Buchenwald when the U.S. Army entered the camp on April 11, 1945. Since, Roth has dedicated his life to educating the world about the Holocaust, receiving numerous honors for his efforts, including the Spirit of Anne Frank Award. The lecture is sponsored by Adelphi's Department of History, Hillel, Chabad Adelphi, Office of Diversity and Inclusion and the Office of the Provost. For more information, visit the Adelphi website (http://events.adelphi.edu/au_event/remembering-the-holoca...) or call (516)-877-4789. Adelphi University is a highly awarded, nationally ranked, powerfully connected doctoral research university offering exceptional liberal arts and sciences programs and professional training with particular strength in its Core Four—Arts and Humanities, STEM and Social Sciences, Business and Education Professions, and Health and Wellness. Adelphi is dedicated to transforming students' lives through small classes, hands-on learning and innovative ways to support student success. Founded in Brooklyn in 1896, Adelphi is Long Island's oldest private coeducational university. Today Adelphi serves over 7,900 students at its beautiful main campus in Garden City, New York—just 23 miles from New York City's cultural and internship opportunities—and at dynamic learning hubs in Manhattan, the Hudson Valley and Suffolk County, and online.